​We hope that the below information assists all our new OzGrav members in getting started and learning what OzGrav is all about. OzGrav is a seven-year ~AUD$40M project funded by the Australian Government through the Australian Research Council Centres of Excellence funding scheme, and is a partnership between our six "Nodes" (Swinburne University - host of OzGrav headquarters, Australian National University, Monash University, University of Adelaide, University of Melbourne, and University of Western Australia), along with other collaborating organisations in Australia and overseas. We have over 150 members spread across our nodes and partner organisations. The mission of OzGrav is to capitalise on the historic first detections of gravitational waves to understand the extreme physics of black holes and warped spacetime, and to inspire the next generation of Australian scientists and engineers through this new window on the Universe. 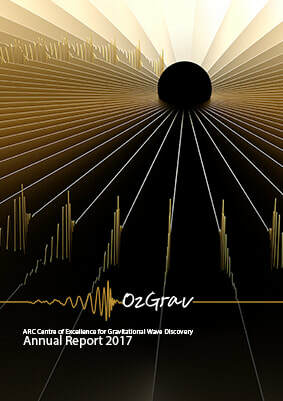 A great way to get your head around what OzGrav does is to flick through our latest Annual Report! Each OzGrav Node has a budget for travel and project costs for its investigators, students, and postdocs. For most funding or resource requirements, in the first instance you should contact your supervisor or Node leader (ANU: David McClelland, Swinburne: Matthew Bailes, University of Adelaide: Peter Veitch, UWA: Chunnong Zhao, University of Melbourne: Andrew Melatos, Monash: Eric Thrane). In addition, OzGrav headquarters run a number of funding awards schemes as outlined below. You may also approach the OzGrav Chief Operating Officer (coo@ozgrav.org) with funding or resource requests that are not covered by your Node or by the schemes below. If you are a new member and haven't already done so please complete the online member form. You will need to be an official OzGrav member in order to be eligible to access OzGrav resources and funding opportunities. We strongly encourage all our members to participate in our mentoring program as mentors, mentees, or both. Please sign up! Sign up for our mentoring program! OzGrav has two travel award schemes to support 1) postdoctoral researchers, students and Associate Investigators to travel and undertake node and site visits, and 2) international visitors to spend time at OzGrav nodes. OzGrav has a funding program to support our members whose professional opportunities may be limited by their primary carer responsibilities. ​OzGrav accepts requests to sponsor events that are relevant and beneficial to our members. We offer funding and travel support to enable our members to contribute to the planning of future gravitational wave detectors. ​It is important that all papers reporting OzGrav work acknowledge OzGrav and ARC, and that papers presenting non-OzGrav work are not marked as OzGrav papers. Please familiarise yourself with our full publication policy on the Intranet. Your affiliation should include "OzGrav". E.g. "OzGrav-Monash, Monash Centre for Astrophysics, School of Physics and Astronomy, Monash University, VIC 3800, Australia"
The Australian Research Council (ARC) must be acknowledged. E.g. "This research was conducted [or "Parts of this research were conducted"] by the Australian Research Council Centre of Excellence for Gravitational Wave Discovery (OzGrav), through project number CE170100004"
There are a range of animations, graphics, and videos here, which you might find useful in your scientific and public presentations. On our intranet you will also find an OzGrav PowerPoint presentation that gives an overview of OzGrav, as well a blank slides template. Contact info@ozgrav.org if you have trouble accessing the intranet. Our outreach team are always happy to receive suggestions for new animations, graphics or apps to help explain our science. We can also help promote your science and events, so let us know you have a new paper with an exciting result, or are involved in an outreach activity. Contact us at epo@ozgrav.org about any of these matters. Being an OzGrav member means having access to great resources and opportunities, and being part of a collaborative community of talented researchers. With great opportunity, comes great responsibility! Adhering to our Code of Conduct. This includes acting fairly and reasonably, and treating colleagues and members of the public with respect, impartiality, and sensitivity. You may also wish to refer to your own institution's policies around harassment, conduct, dispute resolution etc, some of which are listed here. Familiarizing yourself with, and adhering to, our other relevant policies available on the Intranet. Contributing to our reporting requirements (especially our Annual Reports) by providing information when requested in a timely fashion. Sending us any good news stories and interesting science results as they arise, so we can promote your successes via social and traditional media. Actively participating in our weekly Friday videocons, and other relevant meetings. OzGrav is aware that at times work and studies can impact your mental health and wellbeing which can have an effect on your work and home life. OzGrav offers support, information and resources to its members to assist you in looking after your mental health and wellbeing. OzGrav offers its members mental health first aid training (usually through your home institution), where you can learn the signs and symptoms of mental health problems, where and how to get help, and what sort of help has been shown by research to be effective. If you are interested in this training please contact coo@ozgrav.org or info@ozgrav.org for further information. Additionally, there are several support services available to help with mental health issues. If you or someone you care about are going through a difficult time, please reach out and speak to someone. OzGrav members have access to a range of tools and systems that we use for sharing information (e.g. wiki, shared calendars, social media, Github, Slack, videoconferencing tools, mailing lists). These are described on our intranet. Please familiarise yourself with these systems. Contact info@ozgrav.org if you have trouble accessing the Intranet or if you have any questions. It can be confusing when you join OzGrav and are surrounded by an alphabet soup of acronyms. Here's a list of commonly used acronyms to help orient yourself.